Staff were so kind and really helpful! The room was imaculate, the facilities were fantastic as well and we even have a coffee pod machine in the room. Bed was comfortable and beyond our expectations. Would 10% recommend staying. Beautiful place to stay . Clean Comfortable Private. We stayed in a one bedroom appointment Courtyard next to the pool . Love the set up .. Will definitely stay again . 2 nights in Shepparton Lovely clean and modern facilities, fabulous room service & reasturant quality meals , highly recommended ! Nice Hotel Enjoyed my stay, great service by hotel staff and great restaurant. Disappointing that my room needed refreshing i.e. painting and minor repairs to wall damage. business trip easy to find. staff member had a little trouble printing tax invoice receipt and didnt say where in the complex my room actually was so I walked around first before driving in and parking. Work. Bills. Learning how to cook things other than frozen pizza and cheese toasties. Adulting is difficult, so why not take off to Shepparton? Take your pick of one of our 17 brilliant hotels within 5 kilometres of the centre and forget all about all those grown-up responsibilities. 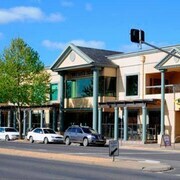 The Best Western Plus The Carrington and the Quest Shepparton are among the most central places to stay in Shepparton. 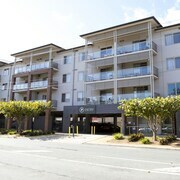 The Best Western Wyndhamere Motel and the Pines Country Club Motor Inn are also well worth your time. Lovers of art should arrange to pop in Gallery Kaiela to see the variety of remarkable artworks being showcased. The Quality Hotel Sherbourne Terrace and Quality Hotel Parklake Shepparton should be at the top of your accomodation hit list if you're looking to stay close by. Take in the serenity at Victoria Lake Park. You'll find ample space for outdoor activities or to just sit back and take it easy. 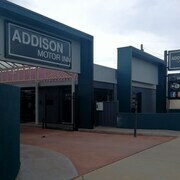 If you're keen to hit the hay after you've seen it, the closest hotel options are the Addison Motor Inn and Overlander Hotel/motel Shepparton. You may like to have a look at some other accommodation spots, such as the Comfort Inn Peppermill or the Secura Lifestyle Shepparton East. The former can be found 5 kilometres from the central areas, and the second is 5 kilometres away. 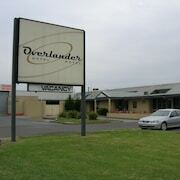 Otherwise, you could make your way 0.7 kilometres away from central Shepparton to the Country Home Motor Inn. If you've been gifted with the wanderlust gene (well duh, you're here right? ), then you'll want to explore the wider High Country region. The area is known for having amazing mountains and snowfields. After staring slack-jawed at nature's artworks, check out well-known tourist sights like history museums. More active types can also have a crack at popular pursuits like snowboarding and skiing. Everyone knows Aussies are pretty laid back, so consider hanging round a little longer and checking out the Monichino Wines and Kinniard Wetlands in Numurkah, 30 kilometres to the north of Shepparton. 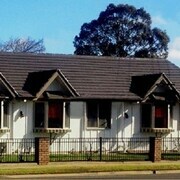 Numurkah hotels and accommodations are the Lakeside Country Club - Numurkah and El Toro Motel Numurkah. 35 kilometres to the west of Shepparton you'll also find Kyabram, which is home to the Kyabram Motor Inn and Ky Country Roads Motor Inn. Whether you're shooting through or staying in Kyabram, set aside some time to visit Edis Park and the Kyabram Fauna Park. Getting ready to land? It won't be long before you can ditch your squeezy cabin seat for a fancy bed! The Big4 Shepparton Park Lane and the Paradise Lakes Motel are pretty close to Shepparton Airport, which is just 6 kilometres from the centre of Shepparton.